We offer modern laser wheel alignment to ensure your wheels are properly aligned to ensure your car drives as it should and to preserve the life of your tyres. Unfortunately, the rigours of day-to-day driving can have an adverse effect on your car’s tracking and wheel alignment. One or two kerbings when you’re trying to fit into that tight parking space and thumping through the odd pothole concealed by surface water can throw your wheels out of alignment. This can affect the way your car handles, and will likely lead to uneven and/or increased tyre wear as your tyres contact the ground at the wrong angle. Even one wheel slightly out of alignment will affect your car’s handling. In more severe cases you may feel the car pulling to one side or feel the ride quality has deteriorated. If you’re concerned, why not have us check it for you? If there is a problem, you’ll be amazed how much better your car handles afterwards. Wheels out of alignment will likely increase tyre wear – and possibly cause uneven tyre wear which will affect the handling and safety of your car. Left unchecked, you’ll be replacing tyres more frequently. If you think your tyres are wearing more than usual or showing signs of uneven wear, get your tracking checked today. The rolling resistance of your tyres on the road affects fuel consumption. If they are poorly aligned, then rolling resistance and therefore fuel consumption will increase. Think you may be using more fuel than usual? 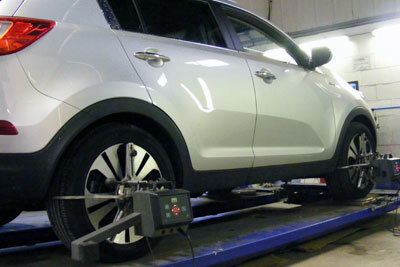 Ask us to check your wheel alignment.